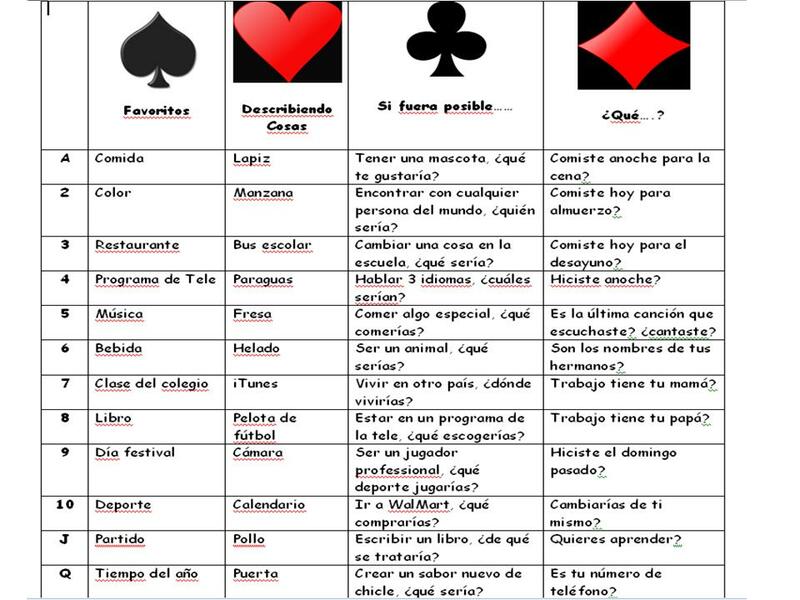 I got the idea for this activity from a presentation made by a TESOL teacher recently and knew that I wanted to revise it and put it in Spanish. I can’t wait to try it out with my students. The activity is called Talking Cards, and you need to have a deck of cards for every group of students. I’m thinking that there will be 4 students in a group, but there could be more. Each student will have the Talking Card sheet below. As you can see there is a category for each suit in the deck of cards, and the categories could certainly be changed to reflect any vocabulary or grammar that you may be working on at the moment. For my first time with the activity, my categories are going to be: favorites, describing things, if it were possible, and what….? Students will draw a card and look at their worksheet to see what they should say based on the card drawn. For example, if the student draws a four of hearts, then he will describe an umbrella in Spanish. If the student draws a seven of clubs, he will then have to say in what country he would live if it were possible to live there. If the student successfully performs the task on the sheet for the card he has drawn, he will score those points. The winner would be the student who has accumulated the most points at the end of a period of time. I don’t think I would wait for the groups to go through all 52 cards! I’m sure there will be all types of variations that could be made for this activity. A category could become an actual physical act to perform, using commands, such as an ace of spades could say Salta tres veces or Canta La Cucaracha. Let me know what ideas you may have. This entry was posted in conditional, conversation, group work, informal assessment, past subjunctive, si clauses, Uncategorized by sraslb. Bookmark the permalink. Awesome idea! I’m thinking of using Spanish naipes to add culture component. I think this is a great idea. I am teaching “Many Face of Mexico” in 4th. (Seniors) Let’s get them to talk about what they are learning! Thank you! This is awesome. I love it! I am going to put it to work as soon as I can! Thanks! Please let me know how it goes with your students…and what other categories you might use! What a fabulous idea! I’m so excited about this activity, I made my own up for Friday. I’m also going to share a PDF of what I come up with on my blog & link it to this post. I’m so glad to see you posting again. I am very sorry for your loss 😦 I thought something was up when I wasn’t seeing you around the web. Thanks so much, Sherry. I posted on your blog that I’m going to use your version of this activity, too. Here’s a quick google doc that I made based upon this idea using the Spanish Naipes to add a cultural component. Feel free to download a copy and change as you wish. Gracias por la idea! Hola. I love this blog! I am going to try the Talking cards with my students and I would like to give proper thanks. Is “gracias al mundobirch por esta idea” sufficient? I want to make sure I recognize your work. Keep those great ideas coming please!! Thanks so much! Though the idea came from something else related to English, if I remember correctly!